Lamborghini Aventador S Roadster in its drop-top version has finally been introduced in its Indian lineup at Rs 5.79 crore (ex-showroom). The model was launched simultaneously both at the ongoing Frankfurt Motor Show 2017 and in India. The Indian auto market is advanced by the number of options of the Aventador S Roadster in terms of trim and color. Apart from these, the Lamborghini’s Indian arm is offering endless personalization accessories via brand’s ‘Ad Personam' personalization program. The Aventador S Roadster shares the Aventador S Coupe design and performance but in a notch higher outlook. The car gets an excellent use of carbon fiber along with revised bumpers for enhanced cooling and aerodynamics. There is not a far difference between both the Aventador S Roadster and its coupe cousin, that is the roof and distinctive lines at the rear. The electronic package on the Aventador comprises of four driving modes-STRADA, SPORT, CORSA and the new EGO. with a single switch between these modes, the throttle, steering suspension and traction response of the car changes in a bit. Even that, the newly introduced EGO mode offers liberty of tuning each mode as per driver’s suit. Furthermore, the introduction of new four-wheel steering not only makes car agile at slow speed but also offers stability at high speed. The steering also has the collaboration of the Lamborghini Dynamic Speed (LDS) which helps in taking even sharp turn-ins than ever before. Equipped with a mid-rear V12 engine the super sports roadster is capable of attaining the top 350kmph and can complete 0-100kmph sprint in just 3 seconds. The Roadster’s coupe cousin completes the same sprint in time less than one second from the model in question. The naturally-aspirated, 6.5-litre V2 motor is rated to generate 740PS of power and 690Nm of peak torque. Finished in matte carbon fibre, the car uses lots of carbon fibre from two-panel roof to the rest of the car. The roof panels weigh under 12kgs, while every panel of the car is around 6 kgs. The roof panels can easily be removed and install quickly in no time with the aids of the easy fastening system. When not in use, the owner can put them in the front boot. 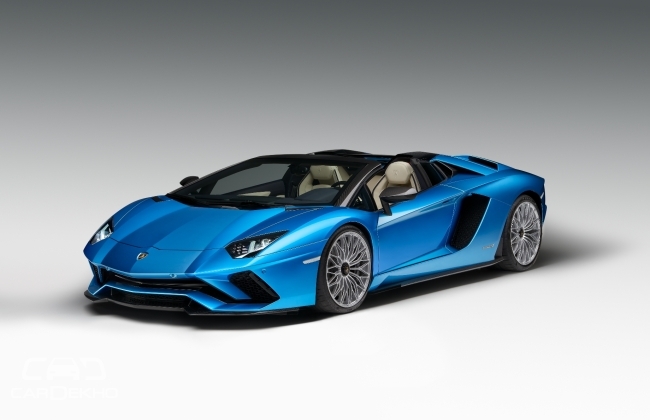 Other than this, the Aventador S Roadster has electrically operated car windows which made it a quintessential open top sports car by reducing air blast in up position. But the desirables have to wait till February 2018.